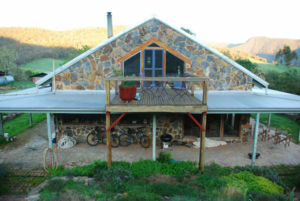 The Kancoona house is a stone dwelling in Victoria's north east that has a standalone energy system using solar, micro hydro and LPG gas backup systems. The micro hydro system in a nearby creek combined with solar panels generates the entire electricity supply. The micro hydro system is fed by 250m of 100ml sewer pipe from a small weir which drops 10.5m to the turbine. Two 16ml jets concentrate water onto a "Platypus Power" peleton wheel, producing 2.2kwH of electricity at 110V. Due to prolonged drought/droughts causing the creek to drying up during summer and autumn months Catherine and Brendan have decided to upgrade the photovoltaics by increasing our number of panels from three to eight, replace the 2200 inverter with a 7000 inverter, and boosting the battery bank from 24 volts to 48 volts. A new regulator is also being fitted to cope with the extra power and system complexities . Local stone was used the build the house. The house cost around $30,000 to build, $10,000 to fit out and $15,000 for the energy-saving system. Poultry and Guinea fowl are guarded by three Maremma Italian mountain dogs. Ferrets are used for rabbit control. This page was last modified 03:49, 27 July 2008.